Althea is celebrating their first anniversary. Happy 1st birthday, Althea! It has been a year since Althea made their way to Malaysia. With its promise to offer lowest price, 100% Korean beauty product authenticity and ships directly from Korea, it is not surprising that Althea has gained its reputation as the No.1 online beauty store for Korean products. On this special day, I would like to extend Althea's birthday giveaway to you! Yes you! For orders placed on 20th July onwards. Check out my Limited Edition Birthday Box from Althea below. While stocks last. Full sized beauty products will be given away to the lucky 1,500 shoppers. While stocks last. 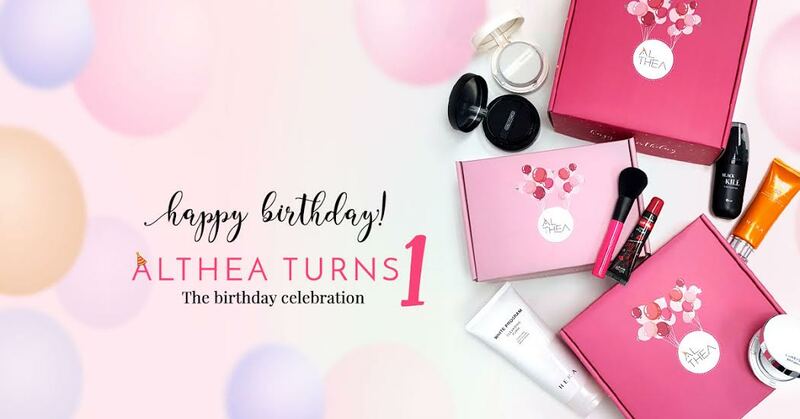 On your Instagram account, post up the party kit photo and wish Althea a happy birthday with hashtag #AltheaTurns1. You will stand a chance to win amazing prices such as Macbook Air, iPad Air 2, iPhone 6S, Samsung Galaxy S6 Edge, Canon EOS M10 Selfie Camera, Althea credits and beauty hampers. A total of KRW10,000,000 prizes to be won by the lucky ones and you could be one of them. Contest runs from 20th July - 15th August 2016. When you head to Althea online store, be prepared to get drown in endless beauty products from skincare to cosmetics and even beauty tools. I admit that shopping at Althea can be confusing because of the extensive choices. If you get that giddy feeling of excitement, let me recommend to you some of my picks from Althea. Now, let's dig into my huge haul from Althea recently. This is Korean's cult product, loved by many Korean artists. The main ingredient of this product is horse fat (no animal cruelty issue here). A lot of beauty bloggers swear by the Guerisson 9 Complex Cream especially for its efficacy in reducing fine lines. It even made a few appearance in Michelle Phan's video/blog. If you are looking for skincare that has medicinal function to repair your wrinkles or scars, pick this up. I have recommended this product on my blog previously as one of the top 10 must-buy Korean beauty product when in South Korea. Now you can get it shipped directly to your home. The Innisfree Jeju Volcanic Pore Clay Mask has a good reputation in diminishing enlarged pores. If you ever Google the reviews on before and after photos, you can see genuine users posting up the amazing improvement on their skin. I am very excited to try out this product. It has been on the top of the list of K-beauty product that I wanted to try for a long time. I love the makeups from Holika Holika due to 2 reasons - one, they packaging is whimsical and very pretty, two, the quality in terms of staying power and pigmentation is really good. This is my third tube and I keep repurchasing this Magic Pole Waterproof Mascara due to the ball tip. It allows me to separate the clumpy lashes easily. It has a very interesting formula where it doesn't smudge or fade when come in contact with water (e.g. rain or swim) but whenever I shower, the mascara is easily removed with just warm water. Have you ever tried a lip tattoo before? I've never tried this revolutionary lip product before. All my lip products are very conventional lipstick or lipgloss type. Since I have dark lips, a friend recommended me to try lip tattoo. The result is very natural and long lasting. There is no sticky feeling like how we usually apply lipstick or gloss and won't stain the mug. The Blingsome Lip Tattoo is one of the Althea's pick and is highly recommended. Ombre lips is still a makeup trend now. With the dual lipstick, I don't have to get 2 different lipstick to achieve the two tone. Apparently the texture is buttery soft and very pigmented. After a few applications, the two tones will blend together and create a gradient effect. This is also another product that I am super excited to try. I will also write a separate review on this. Head to Althea.kr to pick your own stash. If you purchase from 20th July onwards, you will receive this limited edition birthday box and DIY party kit.